7.16 points at 44 votes (rank 320). Choplifter is an arcade game that scrolls horizontally into both directions, where you steer a battle helicopter. Your mission: break the hostile line and rescue the hostages. These are captured in sheds, that need to be opened first. Then you need to land and wait until the hostiles get to your helicopter and then set them down at a close base. A maximum of 16 persons can be transported at once. But be careful, hostile tanks, airplanes and drones will try to stop you - and they definitely won't stop shooting, while you rescue hostages! 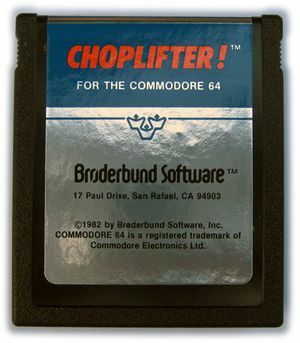 The game is over when all 64 people have been picked up or when you have lost 3 choplifters . 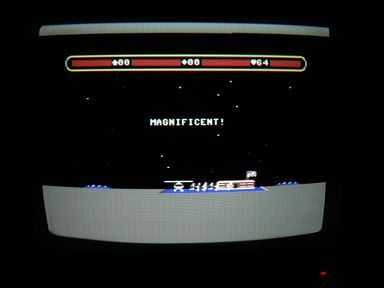 Originally, the game was developed for the Apple II computer and later ported to arcade and video game consoles. Many imitations and clones followed. 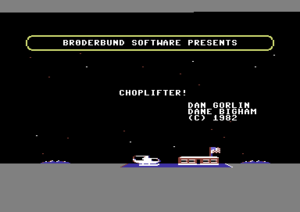 Although this is one of the first commercial C64 games, Choplifter integrates the normally single-colored screen border artfully into the background graphics, and also includes details like the animated flag and the waving people (which were of course primitive compared to later games). For the sprites a kind of anti aliasing is used (blue/red pixel at edges). 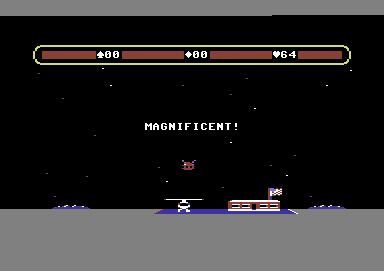 A smiliar thing can be seen in Karateka. The helicopter is controlled by the joystick in port 1. Briefly pressing the fire button causes the helicopter to shoot. Holding down the fire button and pushing the joystick left or right changes the direction that the helicopter faces, allowing you to either enter the forward-facing "tank attacking position", or turning the helicopter completely to the right or left. Tanks and jets attack behind the borderline (to left of the base); the drones will follow you to the base. The people only leave their houses when the houses are on fire. The tanks are usually responsible for this, but the player can also shoot the houses to set them on fire. The display at the top of screen shows (from left to right) the number of POWs killed (spade), the current number passengers in the helicopter (diamond), and the total number of persons evacuated so far (heart). At the beginning you only have to deal with tanks. After the first flight back to the base, you will also be threatened by a jet. On the third level, the drone appears. The total number of enemies is also raised after every flight. The tanks mainly aim for your helicopter, but they are also the biggest enemy threat to the persons to be rescued. That is why it is recommended that you fly sidewards at all times, to be able to destroy the tanks as quickly as possible when needed. The blue jet can be shot. However, it is easier to dodge its missiles... especially when it is flying low. The red drone moves slowly, but always directly towards the helicopter. Therefore, it has to be destroyed quickly if you want to stay in one place for a more than a few seconds. Otherwise you just can avoid it. TheKills: "Interesting game, albeit a bit difficult at some points. For me it belongs in a good collection." 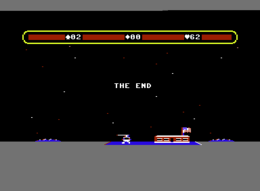 Borna: "With this it all began - one of the first games on the C64, which has presumably also been played by everyone. Tanks are evil, we had to admit to ourselves with a heavy heart." TheRyk: "The first level is a breeze but then it gets rather tricky, when the jets come. By all means this is an evergreen, at which there is not much to criticise as measured by the release year. Very good 7 points!" 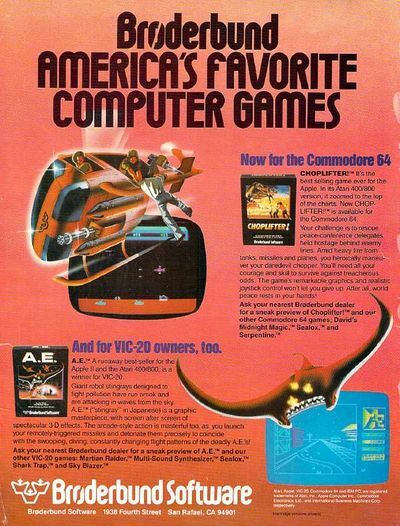 Shakermaker303: "For the year 1982 this is really a cool game. I also like the movements of the helicopter when it turns. But I never really could get into it. However, it gets a nostalgic bonus and that makes then 5 out of 10 points from me - sorry guys." 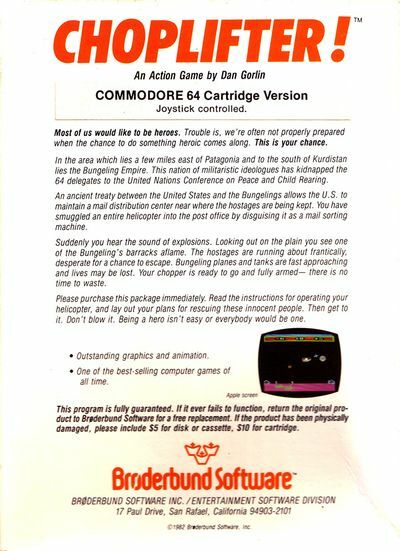 Shmendric: "I didn't like it that much on the C64, graphics mediocre, controls miserable. 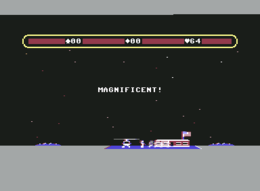 The Sega Master System version was great - admittedly this 'copy' would never have existed without the C64 original..."
Fulgore: "This game has cult status albeit the monotonous gameplay. For that time the helicopter movements alone were absolutely top. I myself had played this game for hours, but when you then had played it through it quickly got boring. However, cult status and hence still 7 points." 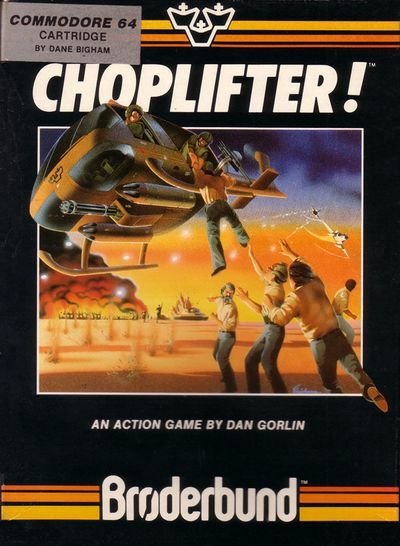 Choplifter in the Killer List Of Videogames. This page was last modified on 30 June 2018, at 23:29.